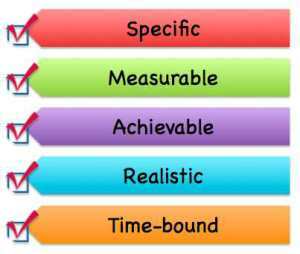 Goal Setting – Be S-M-A-R-T ! Very SMART guide to goal setting! If we cannot measure a goal, we cannot accomplish it. Measurement allows us to plot our process and measure our progress. This means that your goal must lie just beyond our reach so we are motivated to push ourselves past our ‘safe’ comfort-zone – and not out of sight; otherwise, you will lose heart and give up. Returning to the dieting example, a person who wants to lose 25kg in 30 days is being unrealistic.